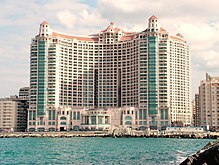 list of tallest buildings and structures in Egypt. Compared to many economies in Africa, Egypt's is quite diversified. However, Egypt is one of the largest tourist destinations in the world, which generates a large percentage of its GDP. People come not only for its lush Mediterranean coastline, but also for its rich history and massive megalithic structures which continue to impose on its skyline even after thousands of years. As such, its status as a major tourist destination is reflected by many of its tallest buildings are hotels and even a couple are the world-famous pyramids. Cairo's skyline is one of the most densely packed in Africa and continues to grow. The tallest project currently under construction is St. Regis Hotel Tower 1 at 180 m (591 ft) tall. This structure will be the tallest building in Egypt when complete. This building will be accompanied by its two smaller twins which will also be the second and third tallest buildings in Egypt. This includes the supertall Eco-tower which, if built, could be well over 500 m (1,640 ft) tall, making it by far the tallest building in Africa. The tallest structure in Egypt at all is the El-Mahalla El-Kubra TV Mast with a height of 323 metres , the tallest free-standing structures are the electricity pylons of Suez Canal powerline crossing with a height of 221 metres. This list ranks Egyptian skyscrapers that stand at least 100 m (328 ft) tall, based on standard height measurement. This includes spires and architectural details but does not include antenna masts. 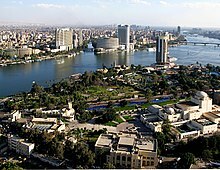 A panorama of the Nile showing Cairo tower in the middle and two major bridges on the far right and left. This lists skyscrapers that are under construction, approved or proposed in Egypt and planned to rise over 100 m (328 ft) tall, but are not yet completed structures. As of February 2011[update] there are 3 buildings under construction and many planned. This page was last edited on 7 February 2019, at 11:22 (UTC).